Happy Valentine’s Day. Here’s a bouquet of black roses for you. Careful with the thorns. I had originally planned to post this round-up yesterday but ran out of time, so most of the songs and videos I’ve selected have been out in the wild for a couple of days. But you still might have missed them, so I’m forging ahead anyway. The number of items in this collection is also large enough that normally I would have divided it into a two-part post, but I was so pleased with the stylistic variety represented in what I’d chosen that I decided to keep it all together in one place. Just take a deep breath (or maybe hyperventilate), and try to get through all of it — I bet you’ll find at least one new song you’ll really enjoy. In not much more than three months from now, NCS will present the third annual edition of Northwest Terror Fest in Seattle. We announced the full three-day line-up on New Year’s Day, but of course, as always seems to happen, since then we’ve had a few bands drop out due to circumstances beyond our own control. 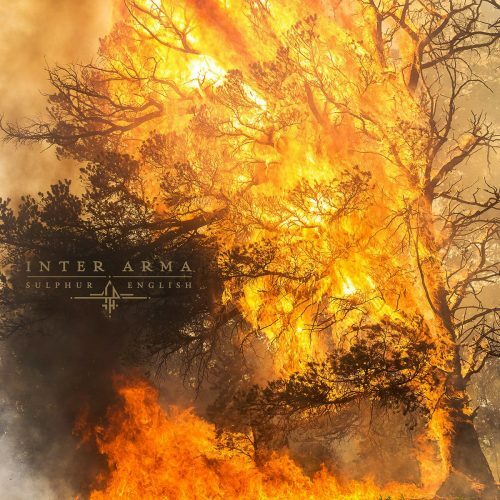 One of those was scheduled to headline a night at one of the two main stages, but we got lucky and were able to secure a great replacement — Virginia’s Inter Arma, who happen to have a new album coming our way this spring. 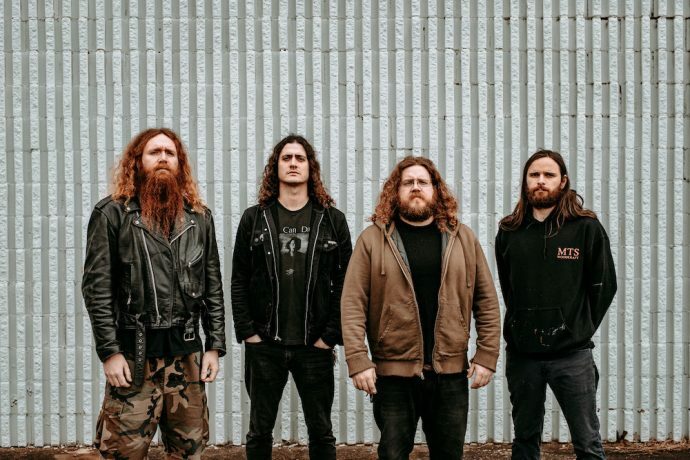 The new album, the band’s fourth, is intriguingly named Sulphur English and it will be released on April 12th by Relapse Records. The first advance track, “Citadel“, surfaced a couple days ago. In retrospect, the song is a ticking time bomb of derangement. Oh, it’s a heaving, heavy, squealing, and moaning monster right from the start, stomping and lurching with bone-mangling force and a horrifying countenance. Bursts of battering drumwork segment the malignant crush-fest, but eventually the monster in the music explodes in a demented shrieking and wailing solo, and then grows increasingly destructive and crazed (there’s another extravagantly maniacal solo near the end). Relapse tells us there’s acoustic music and “psych-folk” ingredients in the album, too. If so, this promises to be a real twisting and turning trip. Four years on after the release of their debut album Regression, Seattle’s own Theories are returning with a new record named Vessel. Two days ago DECIBEL premiered the first song from the album, a relentless blast of death/grind fury named “Human Vessel Cell“. The jet-fast snap of the snare drives this mayhem, and the track’s relatively short run-time is packed with drilling and screeching tremolo riffs and slashing abrasive chords, not to mention blood-curdling vocal extremity and pile-driving force. It’s a savage piece of wet work, and an invigorating herald for a lot more slaughtering to come. 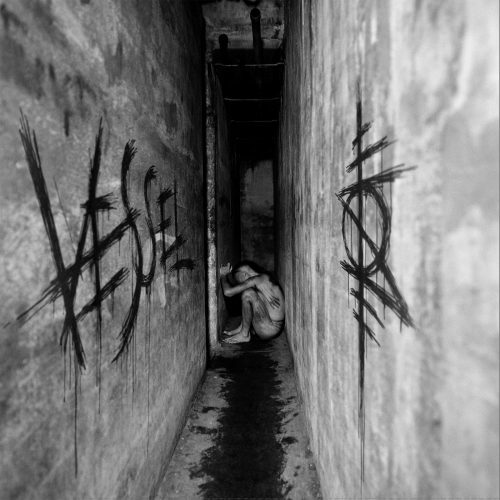 Vessel will be released via Corpse Flower Records on April 12. 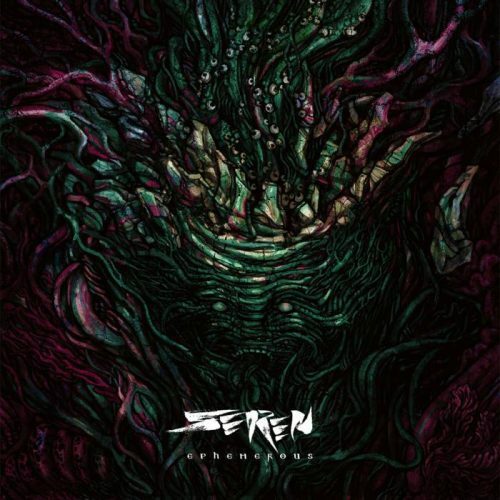 In a recent message, one of my constant sources of valued musical recommendations, starkweather vocalist Rennie Resmini, portrayed the music of Denver-based Seren as “early Cynic style tech death”, “better than numerous bands that do that drill press mechanized guitar style”, and with lead guitar work that “sticks out”. And yes, I completely agree that this new song “Waning Sigil” is a very impressive piece of instrumental adventurism. It starts in relatively soft and beguiling fashion and then gradually ramps up into a seething fury (the vocals are damned scalding in their intensity), breaking into a disorienting rhythmic-focused segment, and then becoming an increasingly kaleidoscopic and head-spinning instrumental extravaganza (the extensive soloing really is spectacular), stitched together with threads of gloomy melody. “Waning Sigil” will appear on an EP named Ephemerous, which is set for release on March 22nd, but the song is available for download now at Bandcamp. A second single from the EP, “Scraps of Life”, will be released on February 22nd. 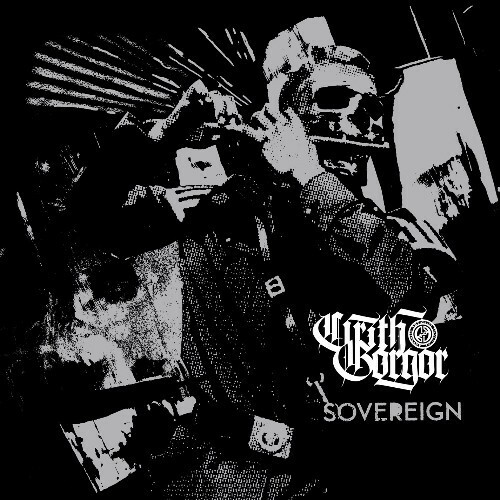 Sovereign is the name of the new album by the Dutch black metal band Cirith Gorgor, who began worshiping the Devil through their music back in the early ’90s. This is the band’s seventh studio album, arriving about three years after Visions of Exalted Lucifer and roughly two years after the 2017 EP Bi den dode hant, which our reviewer TheMadIsraeli showered with high praise. The first excerpt from the new record, a song named “Legio Luporum“, is vicious enough (thanks mainly to the extravagantly nasty vocals), but the real hallmarks of this dynamic track are its changing, keyboard-accented melodies, which create a macabre, hallucinatory atmosphere, something like the bewildering whirl and exultation of a grand and gleaming infernal carnival. It’s an intricate and tempo-dynamic affair that proves to be insidiously seductive, and not something that can be fully digested in a single listen. Very impressive…. This next song is (in part) a big exception to our Rule about singing, but trust me, it is as evil-sounding as music with the most bestial shrieking and roaring (there’s plenty of that here as well). The song is “Erebus and Terror“, presented through a lyric video released two days ago. The stand-out singing in the track was performed by guest artist Sarah Jezebel Deva (Cradle of Filth, Therion, Mortiis), and lyrically the song was inspired by the ill-fated Franklin Expedition, in which the sailors who were stranded in the Northwest Passage were reported to have begun cannibalizing one another. The song is a chilling exposition of men becoming beasts, with a gothic/occult ambience in the soaring keyboards and vocals, a malignant and magisterial eminence portrayed in the ominous, exotic riffs and gargantuan growls, and an eerie, haunting flavor in the softer moments. The music mounts to a crescendo of intensity, in a melding of the tripartite vocals (there are spine-tingling shrieks in the mix as well) and the appearance of a rippling piano melody in the midst of symphonic and percussive bombast. There’s a bit of a lull near the end, and then a ravishing finale. 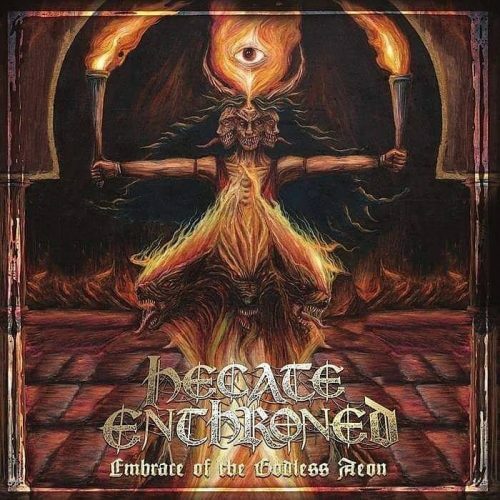 “Erebus and Terror” appears on the sixth album by this long-running UK band, Embrace Of The Godless Aeon, which was released last month by M-Theory Audio. I’m not sure I can warn you strongly enough about this next song. I mean, I like it a lot, but I also feel kind of sadistic in foisting it upon you. The music is profoundly oppressive, heavy enough to rupture organs and fracture spines, and remorselessly heartless and cold. The song is “My Mother, My Cradle, My Tomb“, and it’s one of four long tracks on What Is Imposed Must Be Endured, the debut album by Blind Monarch from Sheffield, England. It will be released by Black Bow Records on April 5th. The label recommends the album for fans of Graves at Sea, Asunder, and Burning Witch. 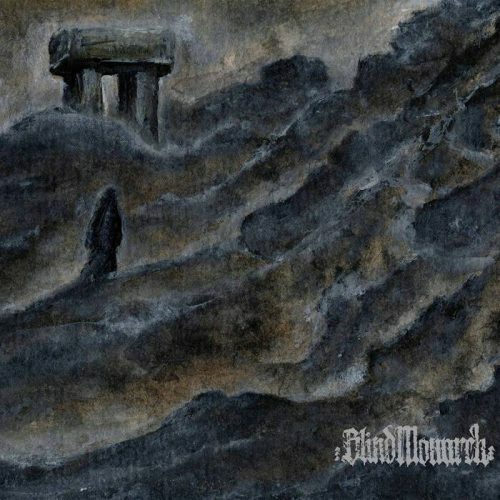 Blind Monarch describe their music as “malevolent and brooding, powerful yet sickly, visceral while haunting,” weaving “moments of a dubious beauty into a corrupted majesty of ugliness and despair”. Based on this one slow, stomping song, I’d say that nails it pretty well. The primitive riffs are palpably dismal and diseased, the shrieking and snarling vocals (which also transform into roars) are downright demonic, and the weird and woozy sounds that emerge have a queasy narcotic effect. And yes, there’s haunting beauty in the song’s softest interlude, too (but it won’t make you feel any better). After that last song I thought it might be a good idea to get your lungs pumping and your blood flowing again, to help with the healing of your organs and bones. So let’s thrash like we’re riding the electric chair, shall we? 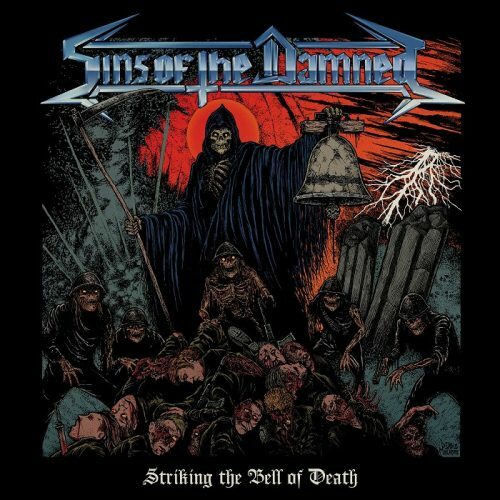 The next song is “Take the Weapons” by the Chilean band Sins of the Damned, and it comes from their debut album Striking the Bell of Death, which will be released by Shadow Kingdom Records on May 3rd. These dudes have cooked up some delicious riffs, and they channel plenty of vicious, hard-driving energy in this dynamic rush. Speaking of vicious, the vocals are the kind of blackened, howling savagery that adds an extra element of hellish hostility to this sinister uproar, which becomes especially uproarious and maniacal when the band really step on the gas in the song’s second half. You’ll be expecting a solo, but you’ll get two, and the first one might not be the kind you were expecting, though the second will singe your eyebrows. Shadow Kingdom recommends the album for fans of classic Razor, Whiplash, Exciter, and Deathrow (Germany) as well as current torchbearers like Desaster, Gospel of the Horns, Deathhammer, and Barbarian. I guess this is an unexpected way to close this round-up. I haven’t listened to this band’s music in a really long time; I took a passing fancy to the djent movement in its hey-day, but the fancy passed, and I became perhaps especially disinterested in the way Periphery‘s music evolved, and thus tuned them out. Given what I know about our followers, I’ll bet that half of you haven’t listened to Periphery in a long time either, and the other half have never listened to them at all. I would have ignored this next song and video but for the urging of my NCS comrade TheMadIsraeli, who said that the music was “oddly brutal” for Periphery. So I indulged him — and damn, he was right. Trust me, I’m not suddenly interested in finding out what I missed in their back catalogue over the last 6 or 7 years, but “Blood Eagle” is a battering, bruising, black-eyed fury, a demolition job with plenty of fast-switching percussive acrobatics and other unexpected twists and turns (plus a head-spinning solo). I’m still not a big fan of the clean vocals, but they’re outnumbered by the raging harsh ones here. Interestingly, the lyrics are themselves also surprising — a celebration of Viking paganism and of the slaughter of Christians, “With drums beating, screams repeating and the hammer force of Thor”. 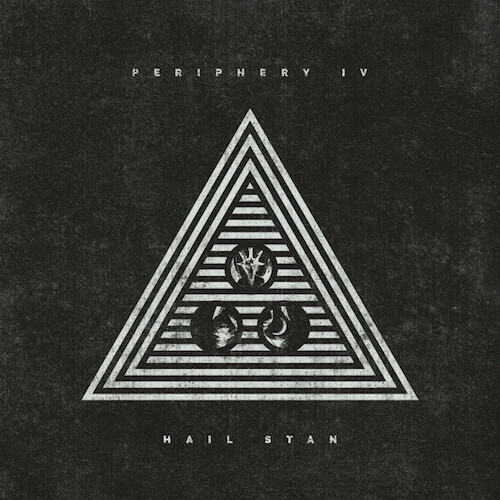 The song is off Periphery IV: HAIL STAN, which will be available April 5th on 3DOT Recordings (the band had a parting of the ways with Sumerian, which might partially explain the change of musical course). That Blind Monarch artwork, though. You have no idea how excited I am that there’s new Theories out there.